There are two great Indian fighters of the war of independence who devoted their entire lives for the freedom of the country but after their death they could not get even two yards of land for burial in their beloved country. The first name among such unfortunate persons is that of the hero of India’s first war of independence Bahadur Shah Zafar and the second name of the same period is that of the great warrior lady Begum Hazrat Mahal who took an active part in India’s first war of independence of 1857. When the British imprisoned Wajid Ali Shah and attacked Avadh, she called upon all the people of Avadh and faced the British boldly. After obtaining permission from the last Moghul emperor, Bahadur Shah Zafar declared her son, Nawab Birjis Qadar the ruler of Avadh and announced her independence. The Begum was a brave and intelligent lady. She valiantly fought the British with the help of Maulvi Ahmadullah Shah, Nanasaheb Peshwa and others. The battle of Alambagh is written in letters of gold in the history of India’s war of independence. This is the same field of Alambagh where she selectively put each and every Englishman to death. On 4 July 1857 the Begum announced throughout Avadh that in that dear land of Avadh, we shall not allow even a single Englishman to remain alive. She appealed to all people of Avadh to kill any Englishman wherever they find him but because of mutual rivalry a large army of Englishmen attacked Avadh. The Begum preferred to fight the British bravely rather than surrendering to them and get arrested but ultimately the English forces captured Lucknow on 17 march 58. The Begum, while fighting somehow reached Nepal. One of her off-springs, late prince Anjum Qadar, who at that time was living in Calcutta’s Matia Burj, told me in a meeting that while in Nepal, the Begum built out of her own money, a palace, an Imambara and a mosque. As long as she was alive, religious functions were regularly held in the imambara. She also built a small office for the maintenance and upkeep of the mosque and the imambara. When she died in Nepal on 7 April 1879, she was buried in the imambara built by her, in accordance with her will. According to Prince Anjum Qadar, the government of Nepal did not take as much interest in the maintenance and upkeep of her grave and other buildings built by her, as it should have taken. Originally a marble plaque was fixed there which contained information about the Begum and every Indian going to Nepal was in a position to know briefly about her. Prince Anjum Qadar had also complaints against Nepal Governments Department of Tourism. His contention is that the department of tourism has not included the mazaar of the Begum and other buildings and documents in the list of items of tourism as a result which lakhs of Indian going there do not get any information about her. He has complaints against Indian embassy also there. According to him, even the Indian government has completely ignored her buildings and the embassy has neither taken any steps for their preservation nor brought out any literature through which people may know about her and pay homage at her mazaar. The prince further told that today there is an office of Nepal government in the palace of the Begum. Because of the apathy and lack of interest of the government of Nepal, many people have illegally occupied some of the lands attached to her palace, imambara and mosque. The occupants have also built same unauthorized and illegal structures around her grave as a result of which her mazaar has become indistinct and hidden behind those structures. The prince said that after India’s independence the first Prime Minister Pundit Jawaharlal Nehru took great interest in Begum’s matters. It was because of his interest that Begum Hazrat Mahal Park was built in Lucknow. The Indian ambassador to Nepal at that time also took great interest in the maintenance and upkeep of her mazar on Nehru’s instructions. Later on, the Indian government issued postal stamp also in the honour and memory of the Begum. Through the medium of ‘sound & light’ programme undertaken by the Ministry of Information & Broadcasting, plays depicting the life and history of the Begum were also shown in different parts of the country. But today the condition of her mazar in Nepal is very bad and the way it is being desecrated is a matter of shame for every Indian. Recently I went Kathmandu, the capital of Nepal, to make a survey of her mazar and tried to locate it. It is surprising that even today the authorities there know nothing about it. When I made further enquires I was told that on the other end of Kathmandu’s Durbar Road, on one side of which is the palace of Nepal’s Maharaja, there is definitely a grave in a dilapidated and desolate condition. When I reached there and made detailed enquires I came to know that it was the grave of the same warrior lady Begum Hazrat Mahal who in 1857 had raised the head of Indians high. That mazar is now a small open grave, which has not even a shade. People have made a small enclosure around it for identification but there is no plaque as a result of which nobody knows whose grave is it and what is his/her relation with history. Some body has opened a paan shop near the grave and another person has opened a saloon. There is no trace of the imambara which was attached to the grave at that time and which the Begum had built with so much devotion in Avadh style of architecture. I was told that quite a few years ago the imambara was demolished and a grand market is situated there now. The beautiful mosque also built by the Begum has been rebuilt in a new style whose grandeur has, of course, been enhanced. The palace built by the Begum in Lakhnawi style near the imambara and the mosque is, of course, still there in its original grandeur but there is an office of Nepal government in it. A mere sight of this building leads one to the conclusion that during the days gone by, this palace must have had a significance of its own. The last ruler of Avadh, Nawab Birjis Qadar, after the death of his mother Begum Hazrat Mahal, went to Matia Burj, Calcutta, the city founded by his father, Nawab Wajid Ali Shah and thereafter never went to Nepal. 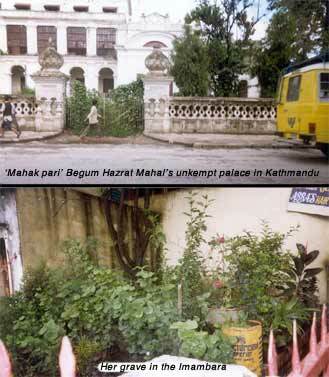 Ever since then the grave of Begum Hazrat Mahal had become neglected. Here lies in slumber Mahak Pari).